Two of Mike Figlia's henchmen mug Nick in front of the Colchester Hotel on the Embarcadero (the hotel was described earlier). When Nick's wallet falls to the ground Rica grabs it and takes off, with the thugs in close pursuit. They catch up with her in Ceylon Street, a narrow alley near Front Street between Clay and Washington which no longer exists after the Golden Gateway Project redevelopment. The map below shows where Ceylon used to be and where the scenes were filmed. The Colchester Hotel was at location 1 and Rica was cornered at location 2. The chase starts in front of the Colchester Hotel, below. ... a vintage photo ... here's the Colchester in an undated photo taken before this block was demolished. Rica is next seen at the south end of Ceylon Street which tees with Clay Street behind her. The small sign says 'Allied Produce Co' - this was the back door of the business of that name at 313 Davis Street. Then ... The thugs close in on Rica and take the wallet from her. This panoramic composite looks north along Ceylon to where it tees into Washington; a large truck is parked across the intersection. A 'John DeMartini Co' sign is behind Rica at a side entrance to the DeMartini building on Washington which spanned Ceylon to Davis. ... and Now, the Golden Gateway Garage has been built where Ceylon Street used to be. The photo below shows the same view today, but taken on the garage's roof garden. 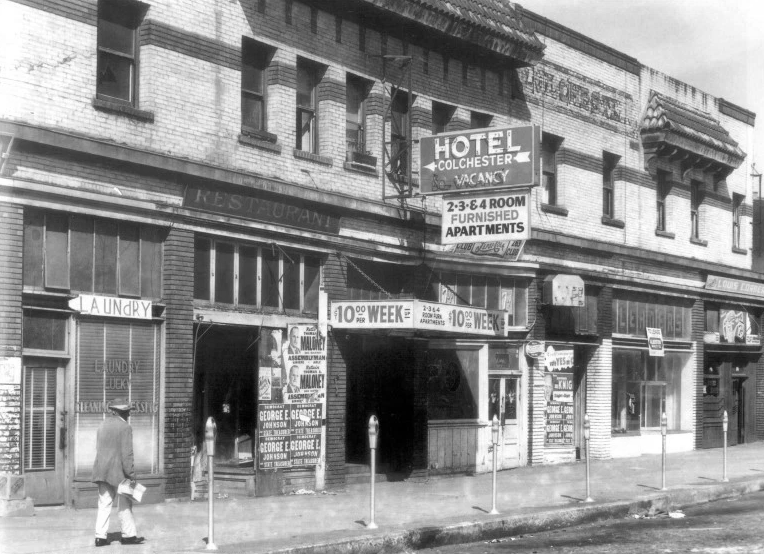 ... an archival photo of Ceylon Street ... CitySleuth has combined two archival photos (below) to show how the Washington/Ceylon corner used to look before the area was redeveloped. On the left, from the 1950s, is a view east down Washington. On the right, from 1944, a view south down Ceylon. This is the opposite direction from the 'Then' movie view along Ceylon, above, but a comparison of the corner building's windows and awning shows it to be the same building.